Reviewed by: Kelsea Denney, a summer student in the department of professional writing at Taylor University. 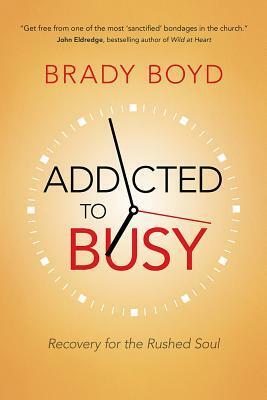 As a reader who normally reads far less nonfiction than fiction, skepticism was at the forefront of my mind as I picked up Brady Boyd’s Addicted to Busy. I even rolled my eyes as I opened the cover, expecting the first few paragraphs to be about the author’s credibility and how perfect he was at balancing his schedule and keeping his stress under control. Instead, the introduction reads, “I’m a complete hypocrite for writing this book because I don’t actually live out the restful rhythms I so passionately espouse.” In this one sentence the reader has a clear sense of Boyd’s voice. Transparency. His honest and humorous narration of various events in his life that led to his need for stress-free living allows Addicted to Busy to be an easy, relatable narrative. Boyd’s individualized, easy-to-accomplish challenges, biblical references and relatable topics are comparable to an enjoyable step-by-step manual on how to eliminate stress and do it with purpose. Boyd suggests that turning worries over to God in all things will lessen the stresses of life. He offers biblical references for a stress-free living. His focus on honoring the Sabbath, taking time for the family, finding non-work related outlets of enjoyment, spending time reading God’s word, and protecting one’s health are pragmatic and appropriate for this fast-paced 21st century life. Kelsea Denney is a summer student in the department of professional writing at Taylor University.